Slice kumquats and remove any seeds. Mince red onion and ginger. Finely slice red chili pepper. Zest and juice lemon. In a saucepan, sauté onion and ginger in a little vegetable oil until translucent, approx. 5 min. Add kumquats and sauté briefly. Deglaze with white wine vinegar, water, and sugar. Let simmer for approx. 20 min. Add the chili pepper and season with salt. Toast sourdough bread in a grill pan. Mix ricotta with olive oil, lemon zest and juice, salt, and pepper. 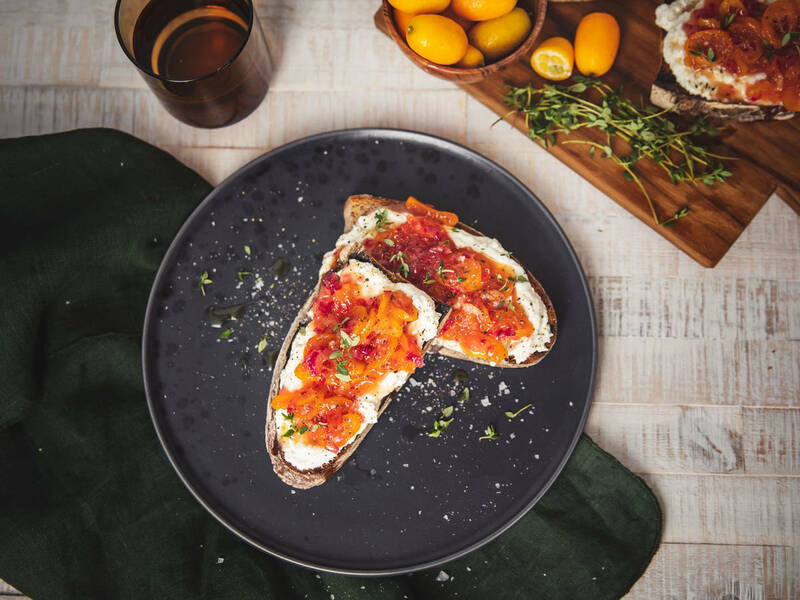 Spread ricotta onto toasted bread and top with kumquat chutney. Garnish with fresh thyme leaves. Enjoy!